Alireza Jahanbakhsh's much-anticipated move to Brighton was completed this afternoon and has been met with widespread delight from Albion fans. The 24-year-old Iran winger has joined from AZ Alkmaar despite interest from fellow Premier League club Leicester. 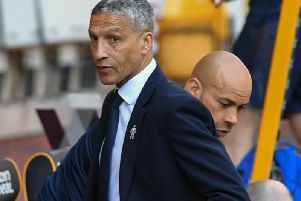 The deal had been rumoured to be close for a few days and the Seagulls have now got their man, which led to many Albion fans congratulating the club on the transfer - and also reflecting on how far the Seagulls have come in the last few years. @daveymark15 tweeted: "#bhafc Christmas seems to have arrived early. A great summer break in terms of getting new players in and early in the window." @sambhafc_ said on Twitter: "In the summer of 2014 we announced the signing of Chris O’Grady. "In the summer of 2018 we announce the signing of Alireza Jahanbakhsh. "How times have changed, eh? #bhafc." @JustKayal posted: "@OfficialBHAFC hats off to the recruitment team this window, you’ve been superb and it’s amazing to see how far our club has come in recent years. Thank you #BHAFC." Replying to Brighton's Twitter post announcing the signing, @JBizzle1982 said: "Unbelievable work... Welcome to the best club in the world!" @northstand1901 added: "Great, great work Albion." ‏@ZZebott said: "YESSSS BEEN WAITING DAYS FOR THIS." @SamPeters_BHAFC posted: "Brilliant news that this has finally happened, welcome to the club @Alirezajb7!." And @JustinBlundell1 wrote: "What a time to be alive." AZ fan @fireAjax added: "You guys must be verry happy with him. "Star player, and a good personality. "Hope to see him back at AZ One time. "But for Now, good luck by #BHAFC." And @GISALEGEND said: "I regularly watch the Eredivisie he was something else especially last season. I looked at him as 1 to watch in the World Cup so will be fun to see what he can do."